To make the sauce, finely chop the garlic and chilli, then gradually blend in the tamarind, sugar, fish sauce, kecap manis and lime juice and mix together. 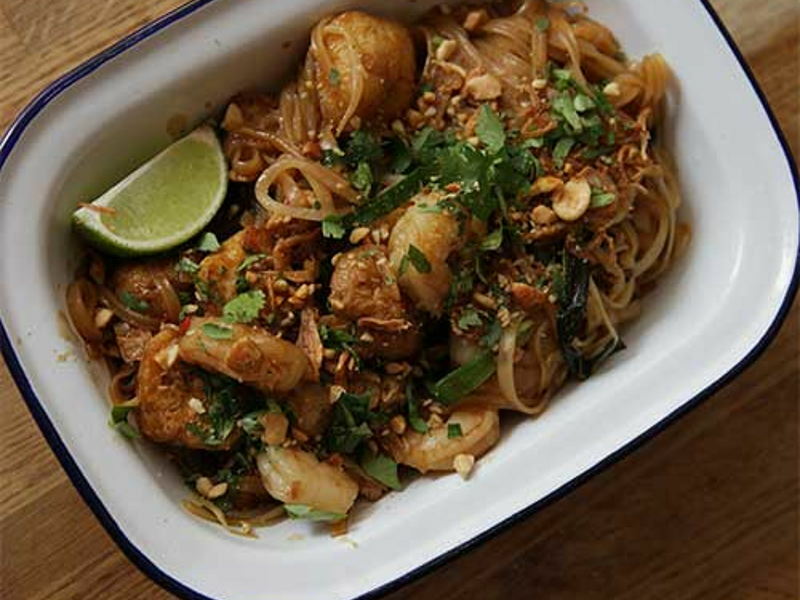 Next build your wok clock as follows; tofu at 12 o’clock, followed by egg, chives, bean sprouts, prawns, rice noodles sauce, garnish (spring onion, roasted peanuts and lime wedges). Over a high fire, heat a teaspoon or so of the oil in your wok until smoking hot, then reduce heat slightly and add the tofu to the wok. Gently stir-fry the tofu until golden brown on all sides then push towards the back or side of the wok. Next, add the egg to the wok. Cook until the white has set, but the inside is still runny. At this stage, break apart the yolk and finish cooking, then push to the back of the wok alongside the tofu. If needed feel free to add in another teaspoon or oil or so to keep your ingredients from sticking to the base of the wok.